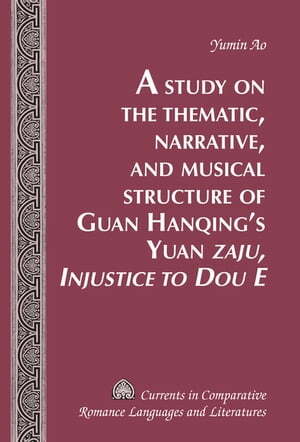 Collins Booksellers - A Study on the Thematic, Narrative, and Musical Structure of Guan Hanqings Yuan «Zaju, Injustice to Dou E» by Yumin Ao, 9781454190172. Buy this book online. This book is a study of the thematic, narrative, and musical structure of Yuanqu xuan [A Selection of Yuan Plays] edition of the Yuan zaju (variety play) Dou E yuan [Injustice to Dou E] originally composed by the highly regarded playwright Guan Hanqing (fl. 1260). Although other authors have studied these three aspects of Dou E yuan separately, this is the first comprehensive treatment of the topic as a scholarly monograph in English. Yumin Ao’s analysis is based on the edition of the play in the Yuanqu xuan [A Selection of Yuan Plays] compiled by the Ming publisher Zang Maoxun (ca. 1550–1620). Ao proposes that Dou E yuan, as a dramatic narrative which develops through its enactment on the stage rather than by verbal presentation as a story, displays its integrative structure of narration through its thematic development and within its musical conventions.